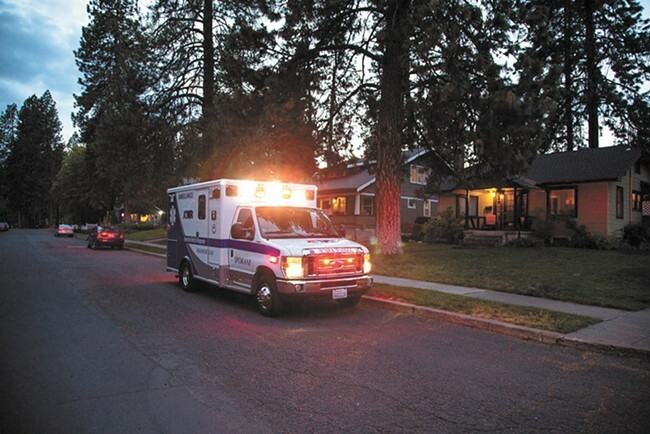 The city put out a request for bids from private ambulance companies looking to provide service in Spokane and got one response: American Medical Response, or AMR, the city's current ambulance provider. "By inserting this wording into the request for bid, you essentially excluded the single most qualified entity in the world," Falck CEO Michael Collins wrote. Between that, AMR's troubled history and the fact that the city's new head of emergency medical services (who was presenting the bid to the council) used to work for AMR, councilmembers were skeptical. Council President Ben Stuckart and others threatened to not approve an AMR contract unless the administration removed the language in question from the request and started the whole process over again. In the face of the council's new veto-proof majority, the mayor announced a do-over. Today, in a meeting room at City Hall, the city opened up the bids it received in the new process and again AMR was the only bidder, says City Spokesman Brian Coddington. Coddington did not know whether AMR's new bid was any different from its initial bid. Representatives from AMR and Falck (see below) were not immediately available for comment. We'll update this post if we hear back from them. In the meantime, AMR's current contract expired Friday, but the company is continuing to provide service under the same terms as its previous contract while negotiating an interim deal with the city. Fire department leadership has said it shouldn't be surprising that the city isn't seeing many bidders. Ambulance companies are struggling across the country and building all the infrastructure needed to take root in a new city is an expensive prospect, especially in a city like Spokane with a large portion of patients receiving Medicaid and Medicare, which reimburse ambulance companies at lower rates than private insurance. Stuckart and City Councilman Jon Snyder say they're not sure how the city can improve the response to bids like this in the long term. For now, they're prepared to approve a new AMR contract. "It's always hard to go back to explain to the citizens why we have a sole-source contract or a contract with only one responsive bidder," Snyder says. "We tried our best to remedy that situation, but, you know, I guess it didn’t work." UPDATE: Falck CEO Collins tells the Inlander Tuesday that he requested “two key pieces of information” from the city that his company needed to bid, but when he didn’t get them, his company opted out. Collins says he also asked for data showing how long it takes to complete ambulance trips to the hospital. The city provided the times of calls, but not the times for when those calls were completed, he says, so his company was unable to estimate how long average trips take and therefore how many ambulances it would need on the street. “We’re not in the business of guessing at the financial structure and viability of the system,” Collins says. Thu., April 25, 7-8 p.m.